When Dave decided to take the family camping this summer, I panicked. Seriously. I had never slept outside. Hell, I wasn't terribly fond of sleeping places other than my own bed, at home. But, we soldiered on. I wanted everyone to have fun, and enjoy the outside, but be as comfortable as we could make it. Dave and I agreed, the more comfortable we were, the more likely we would be to return. In the process we learned a few things, that I am more than happy to share with you. 1. You cannot over pack. The weather may change. You might fall down in the mud. You might find a slippery creek to splash in. You could spill your coffee all over yourself at breakfast. Anything - so, pack several changes of clothing per person, and allow for variable temperatures. 2. Make Lists. Start making lists. One per person for clothing items, toiletries and personal stuff. One for kitchen things, another for food, snacks. Camping gear. Toiletries. First aid stuff. Bug repelling agents. Before you pack it, write it down. Not only will you be able to show the list to the other person, but you can save the list and tweak it for the next time. 3. Prepare for bugs. You are going to be in the woods. There will be bugs. Worms, flies, ants, mosquitoes, spiders (OMG the spiders....) grasshoppers, centipedes. Wear bug repellent. Bring citronella candles, wear those citronella-infused bracelets, build a smoky campfire. Or, if you are Claire and me, do all of the above and STILL BE PREPARED FOR BUG BITES. So bring first aid stuff - band aids and cortisone cream seem to work the best. We figured out that bug bites don't itch as much if they are covered up. 5. Entertainment: When we start packing, we give the kids a large storage bin a piece, with the instructions that they can bring whatever toys will fit into the bin. Then we add a few things when they aren't looking - they have special camping-only coloring books and crayons, kid sized magnifying glasses and flashlights. For ourselves, we unplug. No smart phones, no e-readers. I bring a real book, or a magazine. 6. 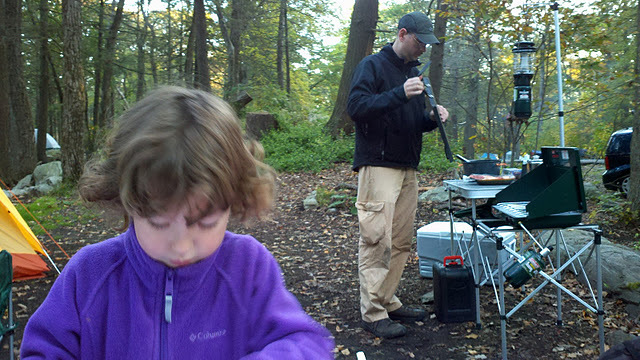 Treat Yourself Right: Just because you're camping, doesn't mean you can't bring good food. 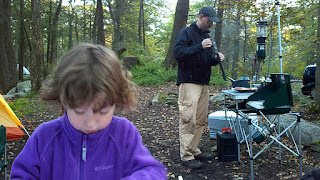 We have a camp stove and a portable burner. We bring food we like to eat - pasta, hot dogs, sausage, eggs, bacon. Coffee (I knew Dave was serious about camping when he bought me an unbreakable French press.) On one memorable trip, my brother-in-law brought home-brewed lager and scallops wrapped with bacon. 7. Enjoy the spectacle. Watch the sunset through the forest, build a roaring fire and roast marshmallows. Listen to the sounds of the night, wait for moonrise. Count the stars. I'm sure there is more, but these are the things that come to mind. We won't be camping again until the weather is warmer. But I can't wait. I've started carrying the "little" camera more often. So much more satisfying than blurry phone snaps.